Use the form on the right to contact me, or click the Contact link at the bottom of any page. Thank you! I will get back to you shorty. The visual works and portfolios of Josh Harmon. Northern California native photographer, videographer, and seeker of moments specializing in portraits, landscapes, and water. As my inspiration changes and shifts between my artistic mediums: video, photography, etc; I find that I only shoot a few rolls of film here and there. Mostly random shoots and moments of whimsical inspiration. Because of this I always have a bag in my freezer of miscellaneous films the need to be processed. The black and white film usually doesn't accumulate for too long as it is easier and fairly convenient for me to process quickly, however what color film I shoot, both e6 and c41, accumulates very slowly. Opening my freezer the other day I noticed a had a decent enough assortment to justify a mail order to Dwayne's Photo to get processed. So I packed up 2 rolls of 120 Kodak Portra 160nc, 1 roll 120 Kodak e100s, and a misc 35mm c41 roll. I have a bunch of other misc 35mm rolls floating around as well, but I decided to save those for another time, or perhaps if I eventually develop a batch myself later on this year. Dwayne's does an excellent job at a very reasonable price and had my film processed and uncut (as I requested) within a week or so. As for my black and white stash; I had 6 rolls on ice: 1 roll of 35mm Kodak Tri-X, 4 rolls of 120 Fomapan 100, and 1 roll of Fomapan 400. I mixed up some fresh Ilford ID-11 developer (I was out of d76 powder, but ID-11 is pretty much the same) and went to town processing. Since I only had 1 liter of stock developer I processed everything at a 1:3 dilution except the roll of 400 Fomapan which I did at 1:1 because I had exposed it at an EI of 800. For most of the Fomapan 100 I developed the rolls together in a large tank where I could process 3 at once. 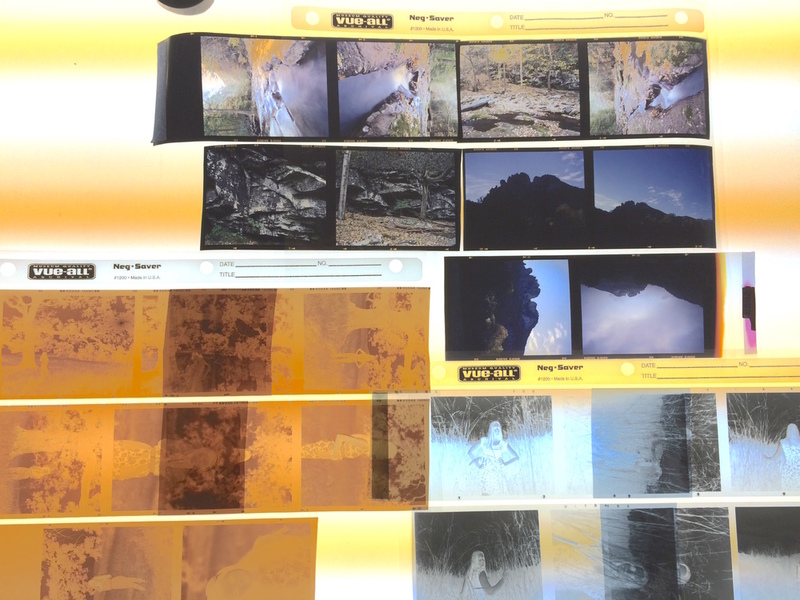 Now that all the film is processed, dried, and sleeved I am scanning it in. Unfortunately the really excellent Nikon Coolscan 8000 I have access to is not working, but luckily the Epson v700, while not as great, works fine. With the v700 I can scan 6 frames of 6x7 at once or a whole roll of 35mm, which is an amazing time saver. The quality is not the best or what I would ideally want, but is plenty good for most any use except large prints. As I keep scanning, which I am doing right now, I will post more entries regarding the individual shoots.